In September 2015 the Council set out a process for preparing a Draft Waimakariri Residential Red Zone Recovery Plan. On 5 February 2016 the Council released the Preliminary Draft Waimakariri Residential Red Zone Recovery Plan (Let’s Plan) which detailed proposed long term land uses in the five regeneration areas (Kaiapoi West, Kaiapoi South, Kaiapoi East, Pines Beach, Kairaki). We sought community comments from 5 February – 4 March 2016. Public hearings were held from 6-8 April 2016. The Hearing Panel considered all comments received and made recommendations to Council. The Council considered and approved the Hearing Panel's recommendations. The Draft Waimakariri Residential Red Zone Recovery Plan was approved by Council on 26 July 2016. 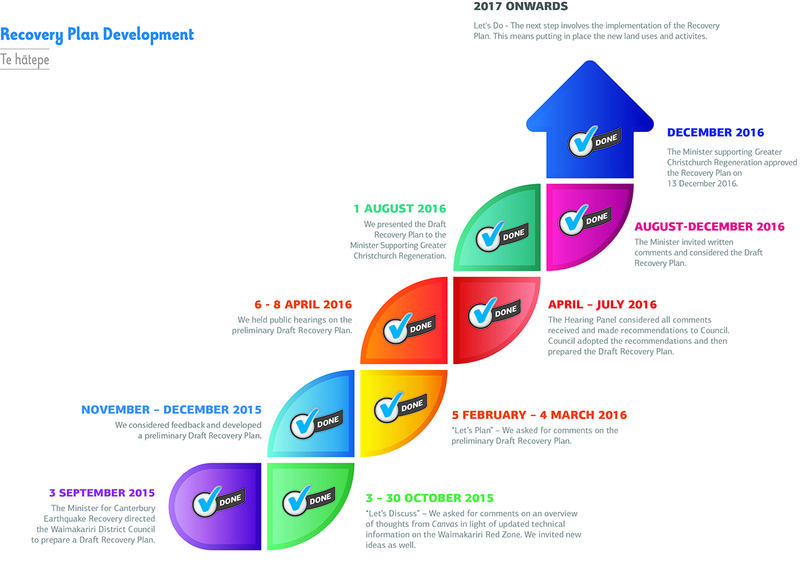 The Draft Waimakariri Residential Red Zone Recovery Plan was presented by the Council to the Minister for Greater Christchurch Regeneration on 1 August 2016. The Minister's officials sought written comments on the Draft Recovery Plan from 4 August to 1 September 2016. After consideration of comments, the Minister approved the Waimakariri Residential Red Zone Recovery Plan on 13 December 2016. Below are the steps and approximate timing of the process. The next step involves the implementation of the Recovery Plan. This means putting in place the new land uses and activities (such as the new road links, walking and cycling paths, green spaces, business and rural activities).